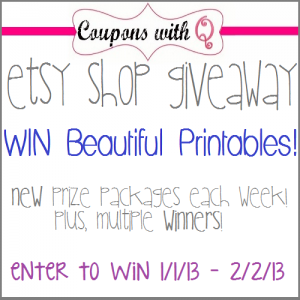 Welcome to Week Four of the Coupons with Q Printables Giveaway! We’re in our fourth week of celebrating the one year anniversary of Coupons with Q Etsy shop being in business! Enjoy a Buy 1 Get 1 Free sale for the entire month of January! We”re having a new giveaway every week of coupon printables to keep you organized and saving money in the new year! Make sure to stop back every week to get your entries in! Everyone has multiple chances to win, plus each giveaway will have multiple winners! Week Four will have FOUR winners. Each prize package is worth $30. Your printables will arrive to you in PDF format via email. The entry form will be open from 12am EST January 27, 2013 until 1159pm EST February 2, 2013. I want to become more organized through my home and life.